Across the country, Detroit-style pizza is gaining popularity, even in markets like New York and Chicago that often shun an outsider’s pie. The popularity of the “red top,” a nickname for the pies that are finished with sauce, is coinciding with the revival of the Motor City itself. Whatever the reason, the square — actually rectangular — pan-baked pies with caramelized cheese on the crust, which borrow from Sicilian and Chicago-style pizzas, are gaining fans as restaurants around the country put their own spin on the recipe. When it comes to Detroit-style pizza, many point to Buddy’s, a classic 72-year-old institution in Detroit, as the source of their inspiration. Buddy’s, also, is capitalizing on the sudden demand for Detroit-style pies. In January, CapitalSpring, a restaurant-focused private-investment firm, announced that it had invested “significant capital” into the chain to accelerate new store growth. “This partnership is a significant opportunity for us to introduce Buddy’s iconic pizza, rich culture and community roots to new customers in Detroit and beyond,” said Robert Jacobs, CEO of Buddy’s, in a statement. But Buddy’s will find that many of the operators it influenced might be now competitors. 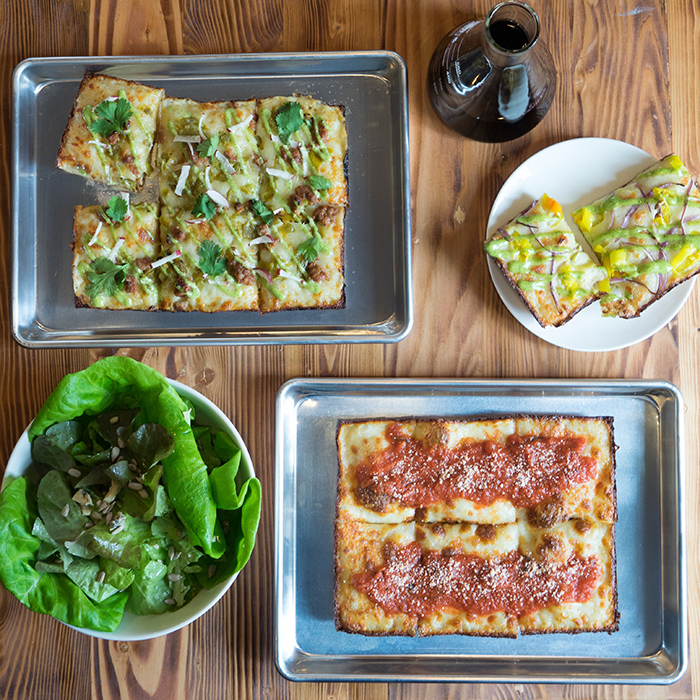 Generally Detroit pizza concepts are full service, but the style is becoming increasingly popular in food halls, like Federal Galley in Pittsburgh, run by Galley Group. 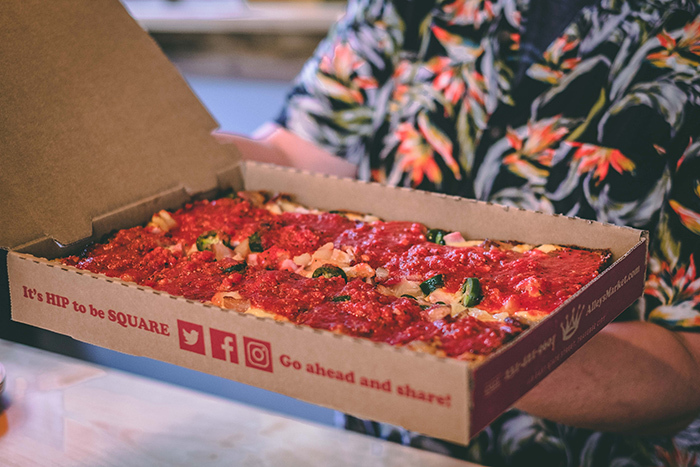 “We try to pick concepts that fill a gap in whichever market we are in, and Pittsburgh definitely doesn’t have many Detroit-style pizza concepts,” said Galley Group co-founder Ben Mantica. Michigan & Trumbull, a restaurant serving Detroit-style pies for $10 to $17, resides in his company’s new food hall. Karen Rampey isn’t from Detroit, but she was inspired by Buddy’s on a trip. She started her brand, Pi-Squared, in 2016 and now runs two locations. The brand also has one franchised unit. All three are in North and South Carolina. Although Rampey serves traditional wood-fire pizza too, a majority of the customers go for the Detroit-style pies, which range from $9 to $16. But she admits she does have to explain to customers what makes Detroit-style different. Even closer to the pie’s origins, customers are sometimes confused, said Simon Joseph, the managing partner and executive chef at Just in Time Hospitality out of Traverse City, Mich. Joseph opened Alley’s Market, a neighborhood convenience store and Detroit-style pizza shop in June 2017. Alley’s Market’s pies range from $12 to $19, with most of his business done in carry out. Joseph is adding delivery next month. In New York, hand-tossed, thin-crust pizza is king, but Matt Hyland wasn’t afraid to bring a different pie to the people. “I am from New York and I love all pizzas — both round and square!” he said. Pizza Loves Emily restaurant group, which Hyland owns with his wife, Emily, started with the more familiar Neapolitan-style pizza at Emily Brooklyn, which opened in 2014. Two years later they brought Detroit-style to the Big Apple with Emmy Squared, also in Brooklyn. They then opened Emily West Village, a hybrid of the two restaurants. The group has recently opened an Emmy Squared location in Nashville, with another set to open in Manhattan soon. Pies, including some funky flavors like the Hula Hog, a white pie with mozzarella, bacon, pineapple and pickled jalapeños, range from $16 to $22. For the owners of Michigan & Trumbull in Pittsburgh’s Federal Galley food hall, it was Emmy Squared that convinced them that Detroit-style pies could have broad appeal. With five units, Austin-based Via 313 is one of the more established restaurants introducing customers to Detroit-style pizza. The brand got its start by serving pies out of a trailer in 2009. Today the average check at the trailers, which have a limited menu, is $17. At their restaurants, it’s $37. Bringing Detroit-style pizza to Chicago was a different story. 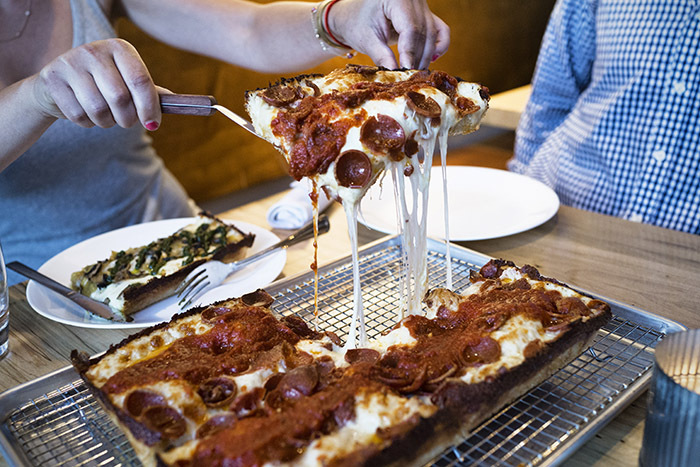 Union Restaurant Group chef and partner Vince DiBattista started by offering regulars a taste of Detroit-style pizza at his restaurant, Union Pizzeria, located just outside of Chicago in Evanston. Although the restaurant serves Italian small plates and wood-fired Neapolitan pies, customers were familiar with a deep dish, this being Chicago after all. 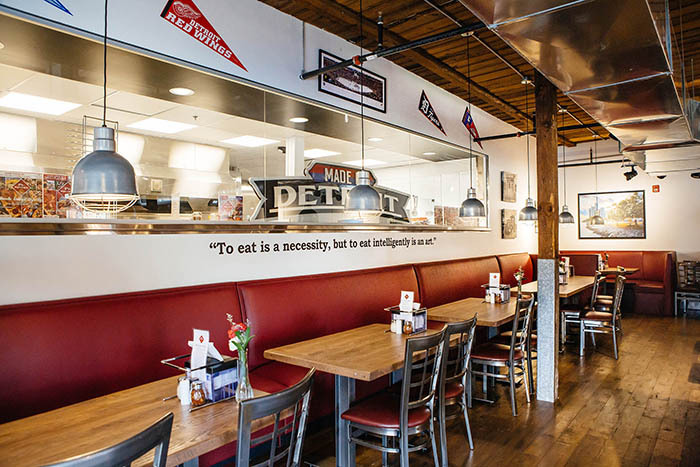 After positive reviews, DiBattista opened Union Squared in Revival Food Hall in Chicago, which serves Detroit-style pies and slices, a rarity for this style of pizza, and shortly after opened a Union Squared location in Evanston. At the food hall, many customers buy the giant slice — really half a pie — for $10, while at the Evanston location, carryout is the focus with pies sold for about $25 each. Now DiBattista is set to open another restaurant in Chicago’s Wrigleyville neighborhood. Union Full Board, with a menu that combines Detroit-style pies along with Italian dishes. Here, DiBattista imagines the Detroit-style pies could be ordered as an appetizer to share with a group. Detroit-style pizza has “a momentum behind it,” said DiBattista, citing the pizza’s popularity on Instagram. Hunt from Via 313 sees humor in his hometown pizza’s newfound celebrity.